Self – it is about the individual; not your parents or your school or your workplace. It is initiated by the individual; not by a curriculum, or a government organisation, or a rigid course. The double ‘l’’s stand for Life Long Learning; that is self-explanatory I think. It could have been three ‘I’’s but that would have been silly. é – because it is an experience. ‘e’ also represents the electronic medium of the virtual and digital world that libraries are part of. The French accent I put in just to give the acronym some French flair, but also because the French appreciate the value of the silly idea. 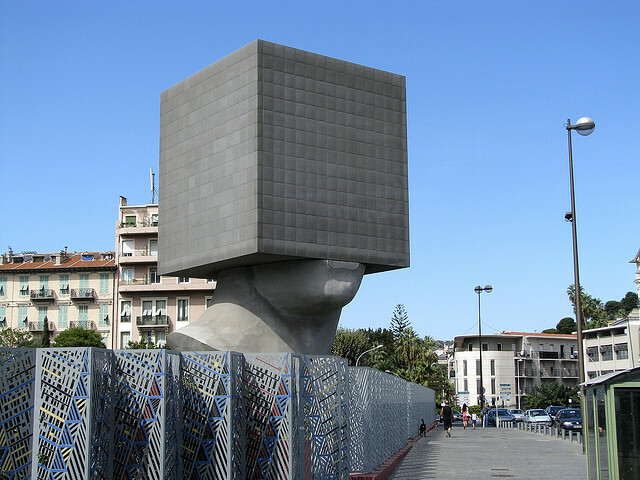 This public library in Nice France is proof of that. Here is an example of the self initiated lifelong learning experience. A chant that featured heavily in the story But I was curious to know how to pronounce the chant and what it sounded like. So I listened to an audio copy of the book and enjoyed the story once again. I heard the pronunciation – “nam-myoho-renge-kyo” – but sadly no chant. So I hopped online to research these things. I found various versions of the chant on YouTube. And I found that the chant means “Devotion to the Mystic Law of the Lotus Sutra”. I also found out that SGI Buddhism stands for Soka Gakkai International and this is a Japanese branch of Buddhism. You could do all of this without the help of the library, however this is where the library catalogue serves as a precision tool for the masterful library users. Using the library catalogue I can bring up the record of the book I enjoyed and then cross-reference by subject to find more books on the topic, or by that author to see what else this guy has written, or by the narrator because I enjoyed hearing the gorgeous English accent of Nicholas Bell. So the self-initiated lifelong learning experience continues… It is a truly unique intellectual wandering specific to me, and my random interests; as it is for everyone. Through this process we learn new things, our knowledge increases, and some of these pursuits might lead to something like a job; but not necessarily. However the impact that is has on improved literacy is immense. And we know that improved literacy helps with freedom of expression, civil liberty and a democratic society. Now let me tell you a story about this man Og Mandino. Augustine Mandino was born in 1923. After schooling he joined the U S Air Force where he became a military officer and a jet fighter pilot. He flew during World War II. After his military duties, Mandino became a door to door insurance salesman. But he was really bad at it. He became an alcoholic, failed his family, and became destitute. He wanted to commit suicide. He went to a gun shop to get a gun and end it all. But the gun shop was closed. Next door there happened to be a library so he went in to wait until the gun shop opened. He browsed through the books in a library, and it was the books about self-help, success and motivation that captured Mandino’s attention. He began reading and found himself there at the end of the day, having forgotten all about the gun. He read hundreds of books that dealt with success, a pastime that helped him alleviate his alcoholism. He found W. Clement Stone’s classic, Success Through a Positive Mental Attitude, and this book changed Mandino’s life. He wrote the bestselling book The Greatest Salesman in the World. His books have sold over 50 million copies and have been translated into over twenty-five different languages. Mandino eventually became a successful writer and speaker. This was before the Internet and before TED talks. He died in 1996. His personal SiLLé experience with the library saved his life.